When your company is starting out, it’s tempting to buy lots of point solutions to solve different growth problems. But this quickly accumulates technical and procedural debt, not to mention lots of recurring costs. 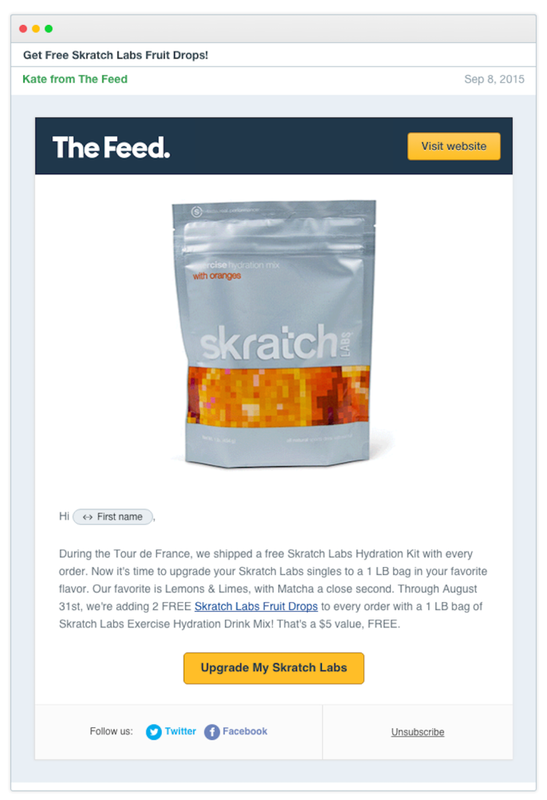 What follows is a guest post from John Franklin, Director of Marketing at The Feed, an online store offering a customized shopping experience for sports nutrition. After enlisting Intercom to provide personalized customer support and send highly targeted, event-based offers, the company saw a 5X rise in revenue. The Feed was founded by Bryan Smith and Matt Johnson, dedicated athletes focused on finding the best nutritional fuel for their various sports. At The Feed, we’ve researched and tried a huge variety of recovery drinks, protein bars, hydration drinks, etc., to help improve and maintain athletic performance. When it comes to sports nutrition, one size does not fit all. We launched The Feed to help athletes find the best products and educate themselves about how to use them. In the beginning, we used several marketing and customer service tools to see what would work best. None of the services were integrated or connected with one another. Customer service was separate from marketing and CRM. There was very little data that could be used when defining audiences for campaigns. In other words, we needed a better way to keep track of and market to our customers. The Feed started using Intercom in January 2015. We opted for Acquire, Engage, and Support products. 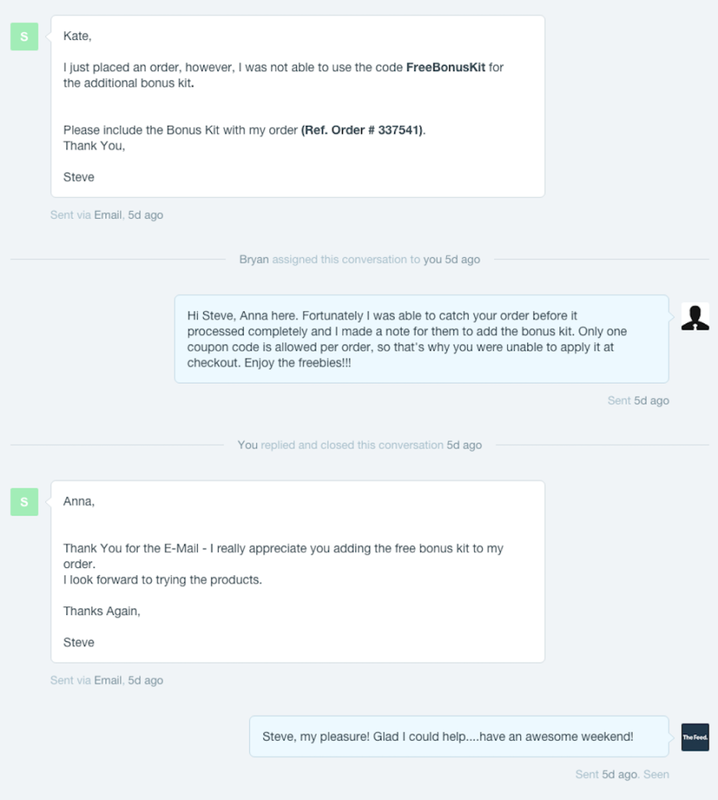 Support came first and was integrated as a quick messaging button on every page of the site. We immediately noticed a 2X boost in customer messages. This was great because it gave us more opportunities to connect on a personal level with visitors to the site and make sure their questions were answered. Customers are automatically added to Intercom as they visit the site and place orders, giving us helpful information about who they are. We know where they are geographically, what they’ve ordered, what sports they’re interested in, and how many Twitter followers they have, among other things. Our team is able to set up custom events that tag customers based on their actions. As a startup marketer, this capability is invaluable. Now we can tag customers if they purchase a certain product multiple times, or if they express interest in a particular type of product (endurance fuel, for instance). The custom tags give us information to build highly targeted campaigns. Recently we included a free sample of hydration drink mix in a selection of customer orders. We were able to tag those customers and follow up with a quick email asking how they liked the new product and suggested they consider purchasing more if they liked it. That follow-up email had a 48% open rate. The Feed has also seen an improvement in email open and click-through rates. We tag customers by sport, dietary needs, etc., which allows us to bring them more relevant content, specific to their interests. For example, ultra-runners can receive articles about endurance nutrition. Crossfit athletes can get articles about proper protein shakes for muscle recovery. On Intercom email campaigns, we see about a 20% open rate. However, with targeted, event-based emails in Intercom, we’re seeing 40-50% average open rates. This is important because higher open rates prove that we’re reaching our customers with more relevant content and offers, based on their past behavior and interests. Using Intercom to manage our nutrition coaching clients has also been really helpful. Since incorporating Intercom, we’ve seen a 5X increase in monthly revenue. That is a mix of existing customers buying more and increased conversions of new customers. We’ve grown tremendously this year, and Intercom has certainly played an important role in that growth.